Raaga.com: Wanna know the song 'Aye Maalik Tere Bande Hum….’ Is sung as Morning Prayer in Pakistan? Wanna know the song 'Aye Maalik Tere Bande Hum….’ Is sung as Morning Prayer in Pakistan? Wanna know that this spiritual song is such a hit that even today it is used as Morning Prayer in many schools in India. In fact the song is also used as Morning Prayer in few schools in Pakistan!!! 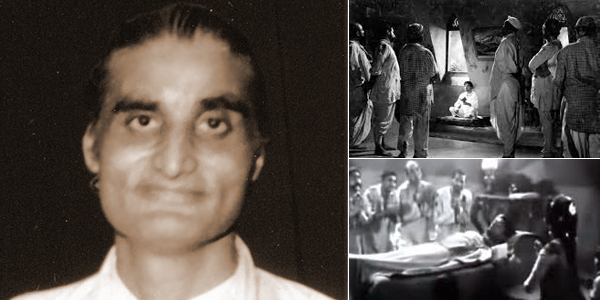 But do you know who has penned this soul stirring song from the black and white classic DO AANKHEN BARAH HAATH? I know the chances are less and only a few handful readers would know the poet though the song is super hit and is still a hot favorite of the younger generation. Well the song has written by the legendary poet Poet Pandit Bharat Vyas, who has to his credit many more super hit songs like Aadha Hai Chandrama Raat Aadhee… (NAVRANG); Saranga Teri Yaad Me Nain Hue Bechain … (SARANGA); Aa Laut Ke Aaja Mere Meet… (RANI ROOPMATI); Nirbal Se Ladai Balvan Ki, Ye Kahani Hai Diye Ki Aur Tufaan Ki… (TOOFAN AUR DEEYA) etc. Raaga.com pays homage to the poet on his death anniversary that falls on July 5. Born on 18th December 1918, in Bikaner district of Rajasthan, Bharat Vyas completed his higher school studies and later completed his B.Com degree. Bharat Vyas came to Bombay in the early 40's. During that time, Bharat Vyas had the dream to become a director and that was the main goal of his life. But, destiny took him to become a lyricist. Under Prithiviraj Kapoor and filmmakers like V Shantaram, Bharat Vyas excelled as a poet of versatility. In a era where Urdu poets like Sahir Ludhianvi, Shakeel Badayuni, Kaifi Azmi etc ruled the roost Bharat Vyas, despite being a Hindi poet made a name for himself. Though he had tough competition from Hindi stalwart poets like Kavi Pradeep, Shailendra, Prem Dhawan, Pandit Vyas made his own identify.